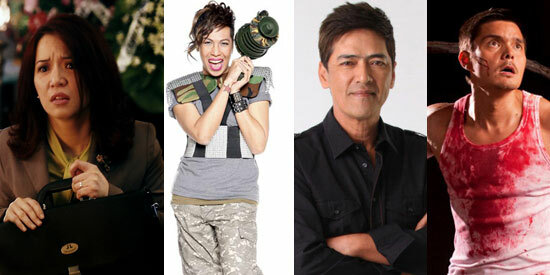 Entries of (L-R) Kris Aquino, Vice Ganda, Vic Sotto and Dingdong Dantes will be part of the 40th MMFF. The eight official entries for the 40th Metro Manila Film Festival (MMFF) were revealed earlier today, June 21. For the 40th edition of the Metro Manila Film Festival, moviegoers can look forward to watching four sequels as well as an historical action film. Robin Padilla will bring life to Andres Bonifacio in Bonifacio, Gusto Mo Ba Siya Makilala? Kubot: The Aswang Chronicles 2 is the sequel to Tiktik: The Aswang Chronicles (2012). The action-comedy horror film starring Dingdong Dantes and Lovi Poe pioneered the extensive use of green screen technology on the big screen. Shake, Rattle & Roll returns once again to offer three horror stories-in-one. The 15th installment is slated to star Dennis Trillo and Carla Abellana. Kris Aquino and Coco Martin will act opposite each other for the first time in Feng Shui 2, a sequel to the blockbuster horror movie that was released in 2004. Vice Ganda will reprise his role as a soldier with a big heart in Praybeyt Benjamin 2, a sequel to The Unkabogable: Praybeyt Benjamin (2011). The other entries chosen include ER Ejercito's Magnum Muslim .357 and the romatic comedy film English Only Please. According to a report by Cata Tibayan of 24 Oras, there are plans to screen the MMFF entries in Guam. In case any of the 8 official entries fail to beat the deadline, the executive committee will check if the ninth and tenth entries are ready to fill in their place. These are: Kid Kulafu (starring Cesar Montano) and Kung Hanap Mo ay Ligaya sa Buhay (starring Boots Anson Roa and Ronnie Liang). The entries that did not make it this year are Whistle Blower starring Nora Aunor and Cherry Pie Picache, Above the Clouds starring Pepe Smith and Ruru Madrid, as well as Bonggagster starring BB Gandanghari.